Shown with Upgraded Pavé Cross Charm & Optional 1st Diamond & Heart Charms. A perfect representation of how pure and precious her heart is, this "Heart of Gold" ID bracelet is a keepsake she is sure to treasure. The Rose Gold, Heart of Gold Christening Engraved ID Bracelet scored a perfect "A" for AWESOMENESS by All who watched my adopted granddaughter's FOREVER MOTHER open the perfectly wrapped gift. It was passed around for each gift to see up close, and ALL AGREED it was one piece of children's jewelry that had not been seen in the major chain stores. AGREEMENT also that it was a beautiful piece that Malia should cherish forever. Thanks to Tiny Blessings' wide assortment of jewelry options, this purchase should be only the beginning of more Tiny Blessings to come for Malia. I have shopped at Tiny Blessings before for another adopted child, non-biological sister of this one. 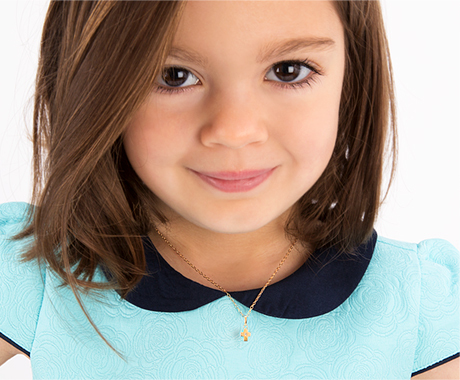 She is 4 now and still loves wearing her Tiny Blessings jewelry. I did not take advantage of the coupon review writing opportunity with hers. Keep on making special moments really special for these young ladies!! !